Bentley’s ready for a ride! Allow new pets become accustomed to the car gradually. Next time, let your pet get used to being in the car with the motor running but stationary. Work up slowly to driving down with street holding your Cavalier. 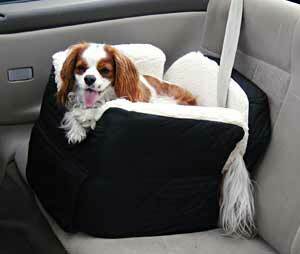 Slowly accustom your Cavalier to a car seat and/or the restraints you have chosen to use. Scroll down to buy this car seat from Amazon.com. Pack essential supplies for your pet whenever traveling. Include a bottle of water, a water dish, some treats (in case your dog gets loose, you may need to lure him back to the car), and an extra leash. On long trips, try not to feed your pet for several hours before traveling to avoid an upset stomach. Bring ice cubes to quench your pet’s thirst. 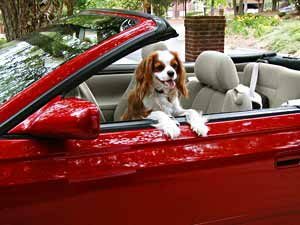 Consider adding sun shades to your car windows to keep your dog cool and comfortable while traveling. Never never never leave your best friend alone in a parked car! Even in the shade with the windows slightly open, it’s amazing how quickly a parked car can heat up to the point where it can be fatal to a small dog. Travel with your dog’s Pet Record and a photo in case your Cavalier gets lost or you need to seek veterinary assistance out of town. Please tell me the name of the car carrier in this picture. I need one for our 29lb cavalier. Want one that will secure front or back seat. Thank you. Thanks for asking, Diane! It’s called a Snoozer Lookout dog car seat. I have added a link to the webpage where you can find it at Amazon.com, if you like. The one I bought has held up for years. The cover removes easily and can be thrown in the washing machine. Yes, I used it in both the front and back seats.